The Market Basket standoff is entering its third week, and neither side seems prepared to give an inch. In fact, a group of eight managers fired last month is preparing to sue the company for wrongful termination. “This was an intimidation attempt to show this could happen to everyone else,” said Douglas Louison, an attorney for the managers. In a letter to chairman Keith Cowan and new CEOs, Felicia Thornton and James Gooch, Louison said the company has illegally withheld pay and benefits from eight managers. Managers like Tom Trainor and Steve Paulenka were let go after hundreds of employees rallied July 18 at the company’s corporate headquarters, demanding the return of Arthur T. Demoulas as CEO. Market Basket’s new CEOs, Felicia Thornton and James Gooch, warned all employees that they could be terminated if they participated in the demonstration instead of going to work. 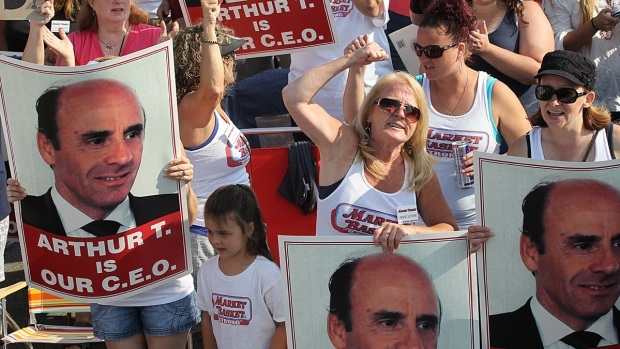 So far, the Market Basket managers are the only ones to have lost their jobs. But that could change next week. The company is urging employees who have not been working to return to their jobs Monday and is preparing to hold job fairs. “Our hope and strong preference is to have Market Basket’s incredible associates return to work,” the company said in a statement. Michael Coyne is dean of the Massachusetts School of Law and he’s says Market Basket has the right to terminate its employees. The Attorneys General in Massachusetts and New Hampshire have told Market Basket they will be watching to see how it deals with employees.